If you are writing academically, you might be wondering about the different types of research papers. Writing a paper might seem like a daunting process, but it’s actually quite easy when you start the work. A research paper is a paper that is designed to be comprehensive, covering its topic without devolving into pointless fluff. Among the many types of papers, research papers are the most involved. By learning the different types of research papers, you will be well-equipped to write intelligent, compelling papers that engross and inform readers. A research paper is defined as a paper that incorporates research, composition, and critical thinking. All of these components are vital. Research papers are not merely compilations of quotes from other sources, paraphrasing, or opinion; they are hard items that require thought and analysis. While there are several different types of research papers, all of them conform to this basic formula. Research papers do not merely involve you reciting information or giving your thoughts; they require you to take a deep dive into a subject, critically evaluate evidence that you find, and draw conclusions based on your observations. As such, they require more work and effort than other types of papers. While there are a number of different types of papers, there are generally two main types of research papers that you will encounter during your academic career: the analytical research paper and the persuasive/argumentative research paper. An analytical research paper is one that is focused on answering a question that is posed. Analytical research papers are intended to be dispassionate discussions of a chosen topic, eschewing emotion and opinion for clearheaded analysis. As such, they typically focus on research and observation, as the writer probes the question from every conceivable angle. A persuasive/argumentative research paper is one that explicitly presents an opinion that the writer wants to convince the reader of. In contrast to the cold, dispassionate nature of an analytical research paper, this type of research paper is more emotional and rhetorical, seeing as it is intended to convince the reader of a particular point of view. However, don’t be fooled: this research paper types is not merely an opinion piece, but must still conform to the structures of a research paper. This means you must still conduct research and observation in the manner of an analytical research paper, with the main difference that you are required to inject your own perspective into your work. Other, less common types of research papers include the cause and effect research paper, the experimental research paper, survey research paper, the problem-solution research paper, and the report paper. The cause and effect research paper focuses on exploring a singular cause and effect structure, answering the questions “Why?” and “What?” in regards to a researched topic. It is commonly used to teach students the basics of writing research papers. Another example of the different types of papers to write is the experimental research paper, which, as the name implies, is about reporting on the results of an experiment. Similarly, a survey research paper involves carrying out a survey, while a report paper involves examining the work already done on a given topic. Finally, among the types of research papers, the problem-solution paper involves researching and arguing for answers to particular problems. 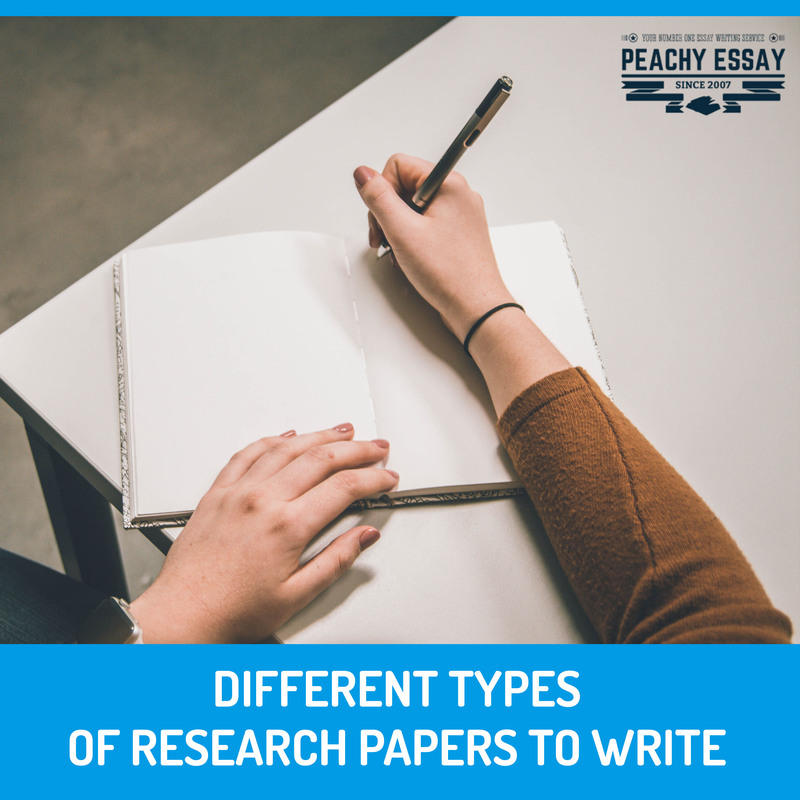 Due to the specialised nature of these research paper types, you won’t encounter them that often in your academic career. However, it behoves you to learn these types of papers to write so that you can become a more well-rounded student. Research papers are an integral part of any student’s career. Learning the different types of papers to write will push your writing skills to the limit, as you will be called upon to pose questions, develop theses, research your chosen topic, evaluate evidence using your knowledge and intuition, and finally present your findings in a clear and articulate manner. Rather than simply expounding your opinion or presenting facts, the various types of research papers require you to use your brain. That said, once you understand the various research paper types, you will be able to craft essays that are articulate, informative, and engrossing. Among the types of papers to write, research papers are difficult, but they are rewarding in that they will teach you the basics of argumentation and analysis, honing your skills in a unique and effective manner.